My first Between Book was a parks fact book. And I wonder sometimes if this type of book is exhausted within the book market since I have read many of them. Would I be able to find room for another fun fact parks book on my shelf? 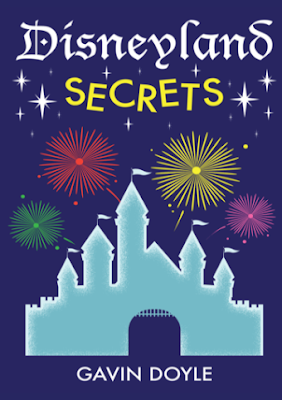 Disneyland Secrets by Gavin Doyle is a land by land reading tour than Disneyland. Doyle takes his readers through each land giving us fun and interesting facts about Disneyland Park. Each page is basically one themed fact with varying detail that all fits on one page. The font is big and easy to read which makes it an easy book to read and honestly easy to give to an upper elementary reader. Honestly, I was taken off guard. There were several new to me facts that I found on these pages. These ranged from cash values for paper tickets, the C-3PO at Star Tours - The Adventure Continues, half painted lights, the Kimball family still working the Disneyland Railroad and several more. These type of facts are the ones that catch my attention. I find them both interesting because they are in my favorite areas of Disneyland. And I find them instructive because despite the amount I read on the park I still had not stumbled on yet. Disneyland Secrets is an easy to read fact book. Honestly, I can see dropping it into a backpack to help entertain a kid while waiting in lines. Another easy use in the park would be to get a Kindle version and read from a phone while waiting in lines. For the new to Disneyland guest there will be plenty to talk about and learn about the park. For the experience veteran they will be pleased to find new fact nuggets. In the end, both types of guests should have a good time.